Soupe au Pistou is a dish I usually associate with sunburn. After a long hard day on that secret uncrowded stone beach we have to hike a mile over a steep hill to get to (no wonder we've got it to ourselves from time to time), we'd drag our tired sun soaked bones home and Brigitte would bring it out to the terrace in a big white ceramic bowl. The cicadas would hum as she ladled it into our soup plates, and the pink evening twighlight set in as we soothed our raging appetites with that and a chilled local rosé to match the sunset. The weather here has been so nice this weekend that this morning when I caught a whiff bright and early of the witchy ladies' fresh garlic I thought of this soup at once. We're seeing the fixings for it now, even in April, and there's no reason not to serve it up and ride this wave. 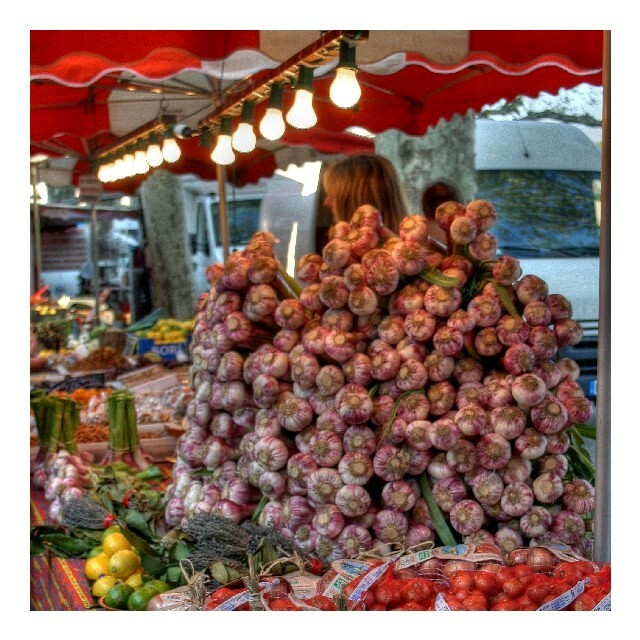 The fresh first garlic really does smell great even from far away. It is milder and juicier than the garlic we have been using all winter, and it's way too young to have a germ to have to fish out of the center! Toss the bitter and sad old leftover garlic pits sprouting green you have swimming in your onion basket! Take a head of this and roast it whole! The following recipe comes from my mother-in-law Brigitte's kitchen notebook. She was born and raised on the French Cote d'Azur, and her mother gave her this recipe. The soup's origins are actually across the border and down the coast a bit in Genoa Italy, but it has been adopted and embraced as a local soup along the French eastern Med coast. There really is no need to 'soup up' the traditional Pistou, which is a celebration of simplicity, really. It is a soup that hovers around the theme of a thickened garlic and fresh basil paste which is placed on the pedestal of a simple wholesome bean and potato soup. Don't fall for the fancy Parisian versions calling for 8 different vegetables or a rainbow display of imported hard to find beans in the stock. Forget the idea of drab winter tubers like leeks or onions in this light and uplifting soup! Please don't fall for posers calling for saffron, and don't feel like you need to go on a long shopping spree to make this soup. Remember what the goal is, keep it simple, and use what you have. Take a pound of green beans cut into little pieces, a handful or more of freshly hulled feves or even peas if you have them, three or four potatoes cut into cubes, and two peeled and chopped tomatoes, and put them in a soup pot. Add 2 liters or a half gallon of water and add more to cover what you've got in the pot by at least one inch, if necessary. Season with sea salt, and bring to a boil. Lower the heat to a simmer for about 20 minutes, until the potatoes and the feves are soft. Add a cup of vermincelli or macaroni and continue to cook at a low simmer for another 15 minutes, making sure it does not burn on the bottom. The soup should be rather thick, the pasta soft. About 5 minutes before serving, thoroughly mash (mash this to a pulp and do it by hand) 4 cloves of garlic with a few branches of basil (for the those who don't know pesto, I'll say 10 fresh basil leaves - for those who know pistou/pesto and have some experience with fresh basil and its strength variations, use your judgement), and add 3 or 4 tablespoons of good fruity olive oil one spoon at a time - whisking briskly like you're raising a mayonnaise (this means whisk it until it thickens up). Take a ladle of the soup and mix it into the pistou (garlic and basil mixture), and then mix all of that gently into the soup with a wooden spoon. Serve hot. Note: Some like to serve their soup with Parmesean. Go ahead if that floats your boat! In my opinion, the cheese is best passed around and sprinkled onto the soup at the table. Interesting how you 'temper' the garlic/basil mixture before adding it to the soup. Mixing the herb and garlic oil emulsion into a cup of the hot soup and then incorporating it into the whole will basically avoid a curdling effect. This is done just before serving, and should be done off heat. There's a reason the pistou (pesto) is added at the end - it does not take well to stewing.